As a leading provider of on water fly fishing guided instruction, we offer our fly fishing "catching" lessons. We take great pride in offering the best local fly fishing lessons and angling opportunities available in North Carolina and Virginia. 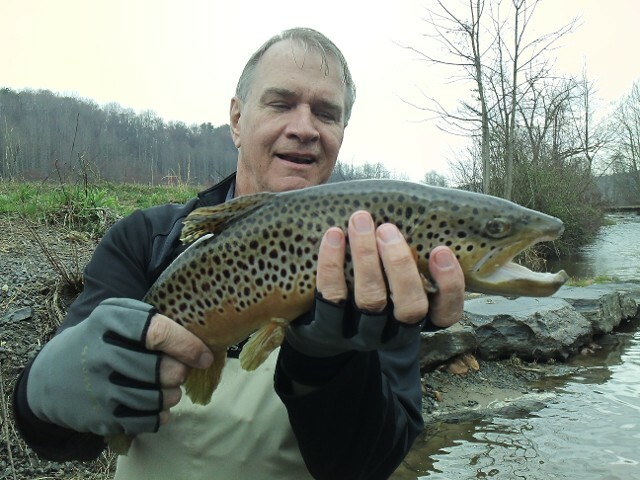 Retired stock broker and fly fishing guide Steve "Nightcrawler" Patterson, for Steve the sport of fly fishing began in the Pennsylvania countryside on the banks of the Little Juniata River. Steve has accumulated a wealth of experience and over 50 years at the sport. He has fished and guided on many streams in North Carolina, Tennessee, Virginia and around the United States. 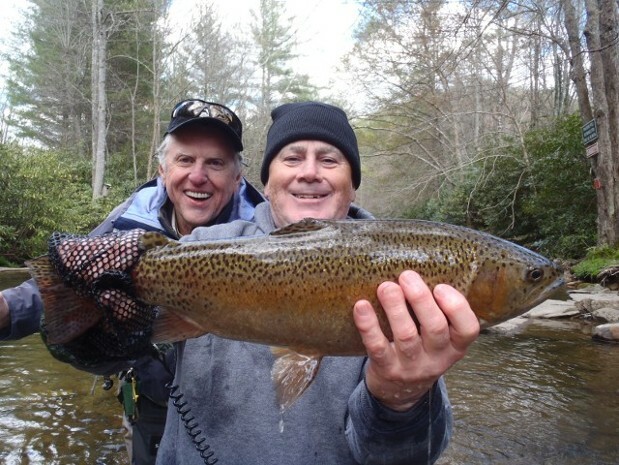 Steve has incredible fly fishing skills and is a great fly fishing instructor and guide. Steve serves as Charlotte Program Director for Charlotte Project Healing Waters and has spearheaded both PHW Charlotte Chapter & U.S.M.C. Wounded Warrior Fly Fishing Program, Steve is a U.S. Army Airborne Veteran. Real estate broker and fly fishing guide Chris "Bearspray" Roche. Chris has over 48 years of angling experience and knowledge on the water and has been guiding & teaching for more than 27 years. Chris feels as though fly fish angling is the pinnacle of all forms of sport fishing. "There's nothing better than replicating a natural food source by tying your own fly or streamer pattern on a fly hook out of thread, feathers and fur and tricking a 20 inch 5 pound trout into eating your fly". Chris has been a Federation of Fly Fishers(FFF) and is a Trout Unlimited Member (TU), former Board Of Director for CFFC. In addition to professionally teaching & guiding Chris fly fish guides for two wounded warrior programs, Charlotte Project Healing Waters and U.S.M.C. Wounded Warriors Fly Fishing. Chris is a US Army Airborne Veteran. Ben is hands down one of the best technical fly fishing guides on our staff, Ben has mad fly fishing skills! 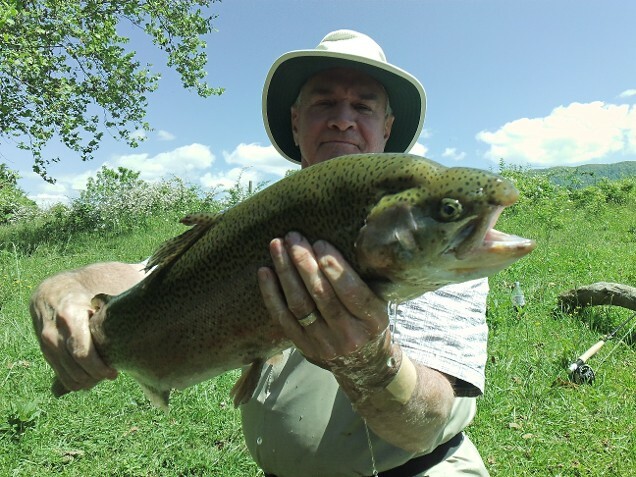 He is one of the best fly fishing guide instructors and fly tyers we have ever come across, patient, knowlegeable and a highly skill fly angler. Best of the best! · II wanted to take my fly-fishing to the next level. I wanted to know what to look for on the river, how to determine the optimal depth to fish and more about the entomology so I knew what fly to fish. I wanted to get better even though I consider myself a descent fisherman. I mean after all, I can cast (most of the time)! I had no idea how much he would teach me that day! · My wife decided to join us. This itself was significant because she hadn’t been out in 5 years. See she slipped and “went under” filling her waders full of cold Tennessee water on our last guide trip. She hadn’t been back since. Chris fixed that problem. As soon as she was on the water, she caught 4 fish including the trifecta – brook, brown and rainbow. It was a rainy, cold day and Chris knew enough to have her get out of the rain and into the car to warm up. Me; typical husband, wanted her to continue – after all we were catching fish! · If you have ever been to the Mitchell River, it’s little more than a creek. With Chris’s direction, I too caught the trifecta but better yet I managed to haul in a 17-inch brown (OK, it might have been 16 inches but it had a hooked jaw!?!) and a large brook out of the river. I was stoked! Bottom-line; Chris is “the guy” you want to change your game or just have a fun day on the water. He’s a great coach, patient and a lot of fun to be around. I don’t know many people who love their job but Chris sure does. "This was a great way to spend a Saturday. Steve, the guide, was an expert and was very patient and informative. I highly recommend this company." "Guide trip far exceeded our expectations and a great value for the price! Chris Roche is knowledgeable, patient, and extremely helpful. It was my adult son's first experience and Chris converted him to a fly fisherman. I would sign up again in a heart beat!" "Chris is the very best, I've used several other guide services in the area and Chris's service for the money exceeds everyone else"
"Excellent guide trip, 5 stars, I live in trout country in Colorado and have used dozens of guides here. I caught bigger trout and more trout in Virginia than I did in Alaska, for a fraction of the price too!!" "Had an amazing time with Chris. Through all the tangled line and lost flies he never got upset or short. We will definitely use Chris again. By far the best fly fishing experience I have had since I started." 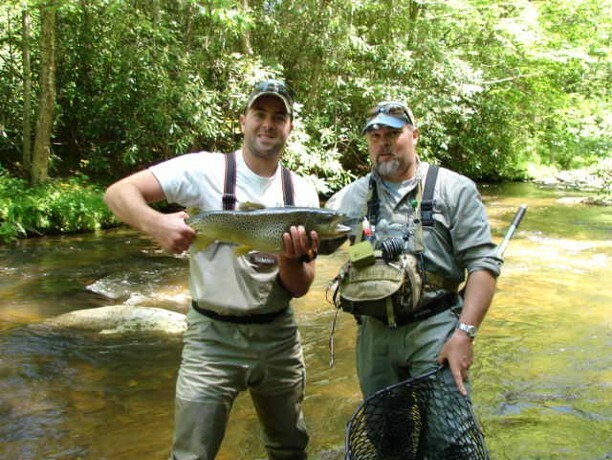 "This was our second trip with NC Fly Fishing Guide Service and once again it was an excellent experience. We are looking at another trip already. If you and friends enjoy the outdoors and want to learn about fly fishing this is the deal for you. Chris stayed in touch with details we needed before the trip, provided everything we needed during the trip and has a vast amount of knowledge about trout and the streams we fished. Excellent day!" "Perfect as a beginner fly fishing session. Friendly, experienced guide who "knows fly fishing"." Great way to spend the day. From the more experienced to beginner fly fisher, Chris was a very knowledgeable and patient guide. I would definitely book a trip again with Chris and the NC Fly Fishing Guide Service. Chris is an excellent guide and a fun person to be with. I highly recommend him as a guide. Chris our guide was fantastic. Well organized, very good equipment, very knowlegeable, lots of patience, and very informative. We will definitely use him again! "WOW!! What an awesome day! Chris is such a nice guy and such a skilled fly fishing guide. Had us on the fish all day and really helped us learn the art of fly fishing. I will definitely be back for more." "Great experience. Laid back and fun but very informative. Extremely patient with first time fly fishers. He got us on fish quick and often and kept us moving and trying different techniques. I highly recommend." I booked this trip for my sons birthday. It met and far exceeded my expectations. We had a FABULOUS day! picked up some new skills and my son picked up a lot of new tips. Chris was an incredible guide, showing us the best places to fish and explaining why we should choose the flies we used. It was a perfect day and a great time was had by all. "What a great experience. Chris, our guide, was an excellent teacher. It was a beautiful day and we began catching trout almost immediately. Chris takes the mystery out of fishing with a fly rod and provides simple and effective techniques for any level fisherman or beginner for catching fish. Best guide trip I have purchased. I met Chris when I moved to North Carolina from Florida...since I used to fly fish for trout in NJ, NY, VT over 30 years ago, I decided that I'd like to try it again in NC. Chris guided me for a half day at East Prong Roaring River and I literally caught my first huge Brown trout on my second cast...and then another dozen(at least) ending with a huge 16" Brook trout...I actually gave up counting because of all my screaming! The reason that Chris is such a great guide...he really loves to see people catch and release preserving the natural resource...that day he had as much fun as I did, he's 'trout smart'! I have had the pleasure of knowing Chris Roche for the past five years. We met through Project Healing Waters Program, which is a disabled Veterans fly fishing organization, at which he was an instructor/guide as well as an honorable Veteran. Chris Roche is quite versed in fly fishing and tying. He is an outstanding organizer when it comes to fly fishing outings. 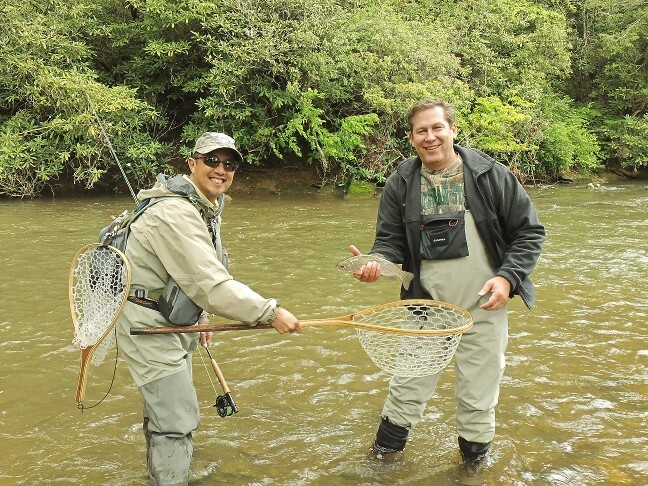 Every fishing trip with Chris is always filled with enjoyment, relaxation, and most importantly, I was able to catch more than my fair share of trout. Time spent with Chris was truly worth its weight in gold. The man "sure knows what he is doing" and is a true blessing to me. Chris, I wanted to drop you a note, THANK YOU!!! Most relaxing weekend we've had in a long time. You made learning to fly fish so much fun and you are a very patient teacher. I'm amazed that we caught so many fish, we couldn't have done it without your expert guidance. Chris is the best fly fishing guide I've ever had. Thanks again Chris. I can't express our gratitude. Great job guiding, you picked the right fly one after another. The South Holston river is a beautiful place to fly fish and we enjoyed the our stay in the farmhouse. I'm looking forward to booking another guide trip with you in a few months. The fly fishing, food and lodging were first class, we loved the prime rib!! No need for me to spend $6000 to go to Alaska for a week and not catch any fish, for now on I'm booking my guide trips with you. Bearspray, thanks man, awesome job! Can't wait until next time, I can't believe I caught that many trout, kudo's to you guy you know what you're doing. I hope one day you will tell me the story on how you got that nick name? Bear Spray, You're an excellent fly fishing guide. Again, thank you for the great fishing trip. I've fly fished all over the world and have met very few guides that are as knowledgeable about fly fishing. You seemed to always be able to find the fish and find the exact fly and right set up for the particular situation, job well done my friend. I will book another trip next Spring. Chris' fishing skills and knowledge of the areas' waters are exceptional. He knows where the fish are, what fly to use, and where to cast. He make fly fishing easy and fun while increasing your skills. Chris is a great fly fishing guide, great food and he mixes a great bloody mary too! Chris, Our fly fishing trip to Wilson creek gorge was wonderful, very nice scenery. It reminded me of fly fishing out west in Colorado or Wyoming, Wilson Creek is a beautiful place. You are a very patient guide and you are very helpful....my wife complimented you multiple times that she thought you were the best fly fishing guide and teacher we have ever had. She was thrilled to catch 7 nice trout. Just being in such a beautiful place listening to the water was very relaxing in itself. We will very likely hire you next Summer to do the Eagle Creek trip you mentioned in the GSMNP. Nightcrawler is a great guide and fly fishing teacher, he taught me everything I needed to know to catch huge trophy trout on a fly rod in about a hour and everywhere he showed me to fish I caught nice trout. He knows what he's doing when it comes to fly fishing. This is exactly the type of outdoor sport I needed to take up after being wounded in Iraq, its very peaceful and relaxing.